Barefoot Partner PointCentral, offers some thoughts on automating energy management for vacation rental management companies and homeowners. Few things are more costly or frustrating to homeowners and vacation rental managers than managing energy in their properties. How many times have housekeepers discovered a sliding door or window left open while the AC was running full blast? And how often does a guest depart and leave the AC set to 68? It’s a common problem that not only drives up monthly utility bills, it can also wreak havoc with HVAC systems, causing them to freeze up or succumb to a costly premature failure. New automated energy management solutions from companies like PointCentral are solving these problems and providing additional guest benefits. Thanks to Smart Home technology, vacation rental managers can install thermostats in every property that can be monitored and controlled from a central location. And with advanced software, the thermostats can be controlled automatically. Now, instead of allowing a guest to set the temperature to some extreme level, you can set high/low limits that restrict someone from doing that. This saves energy, reduces costs and makes for much happier homeowners. On top of that, you can set temperatures that automatically adjust based on occupancy. When a guest is due to arrive today, the AC or heat will automatically adjust to the comfortable arrival temperature that you pre-programmed. When the guest departs, the thermostat is automatically adjusted to the energy-saving level. This saves energy, reduces costs and makes for much happier guests. For humid climates, smart thermostats can automatically adjust the air conditioning when humidity levels exceed certain thresholds. This prevents costly mold problems in properties and limits mites and other pests that are attracted to moist environments. And, your guests will be much more comfortable. You can also activate notifications that will automatically alert you or your staff when humidity levels exceed thresholds. 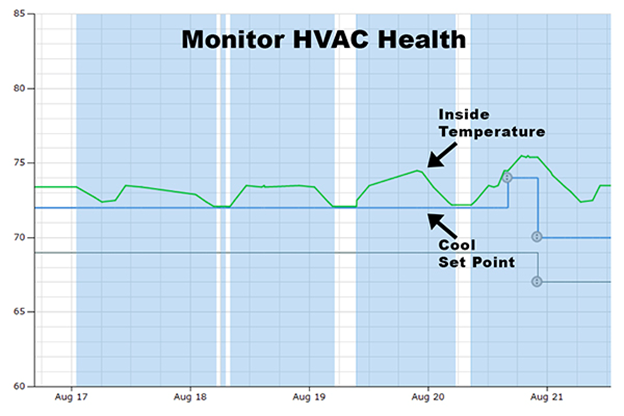 One of the biggest advantages of automated energy management is the ability to monitor the health of your HVAC systems. By tracking how efficiently your system is keeping up with the desired temperatures, you can identify problems and perform maintenance rather than wait for a more costly failure. As this graph from PointCentral shows, this particular HVAC system is not able to maintain the inside temperature to the desired set point, even though the system is running more often than not (indicated by the blue background). Clearly, this system should be looked at. Energy management can also be enhanced by adding door and window sensors to properties. These are small pairs of sensors that, when separated, send an “open” signal to the central controller – such as when a sliding door or window is open. When this occurs, the controller can be set to automatically shut off the AC, thus savings energy and preventing an HVAC freeze up. Energy automation need not continue to be a problem for homeowners and vacation rental mangers. Smart Home technology is the answer. For more information about PointCentral, please visit their page here.